Have you ever felt overwhelmed by the abundance of incoherent writing ideas taking up space in your brain? When I conference with writers, they often let me know that they’re experiencing this by sharing statements like….. 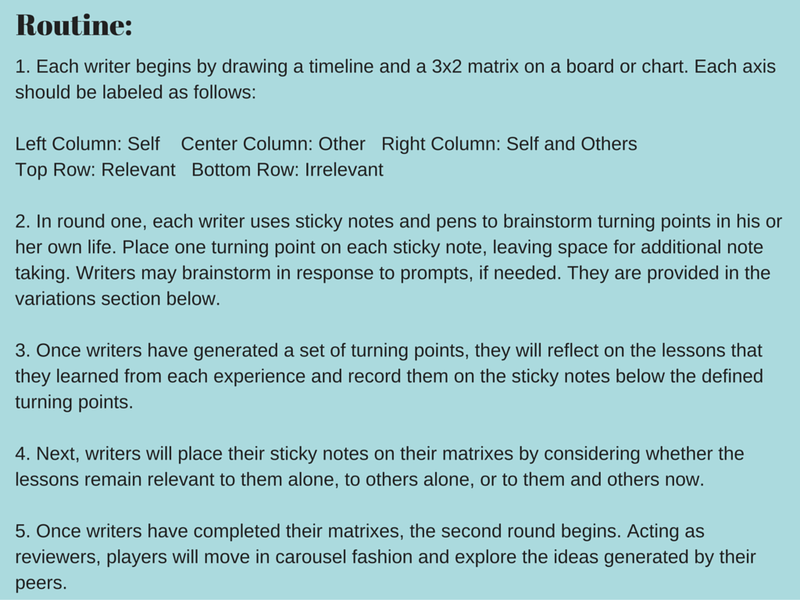 I find that placing graphic organizers in front of writers at moments like these can often do far more harm than good. Graphic organizers are flat and static.They also command immediate coherence, stifling the idea generation process or at the very least, forcing boundaries around it. 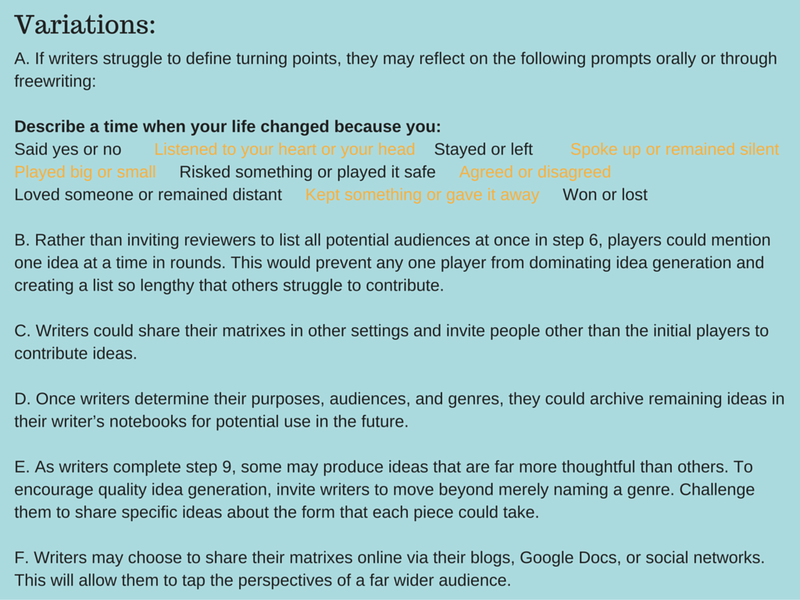 Gamestorming helps writers map and connect their thoughts in the same way that graphic organizers intend to, without rigid frames. 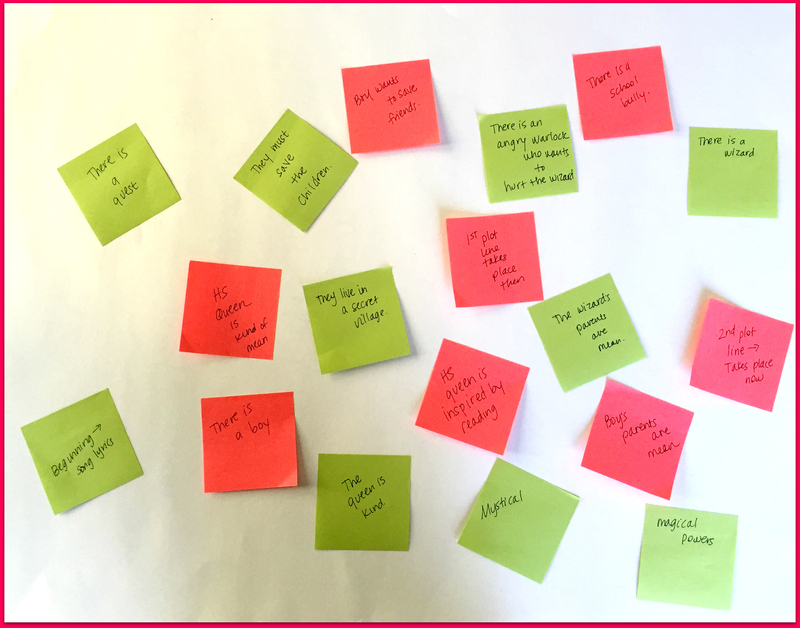 Consider this: What if you asked me to help you map out a story, and I handed you a graphic organizer and asked you to brainstorm each element of the plot? How would this effect the way you generated and organized your ideas? What would that process look like? How would it feel? Now consider this: What if, instead of handing you a graphic organizer, I inspired you to think about real people, fantastical characters, profound dilemmas, and important messages that you want to share with the world, and what if I encouraged you to brainstorm many great possibilities for your story? How would that effect the number and quality of the ideas that you generated? 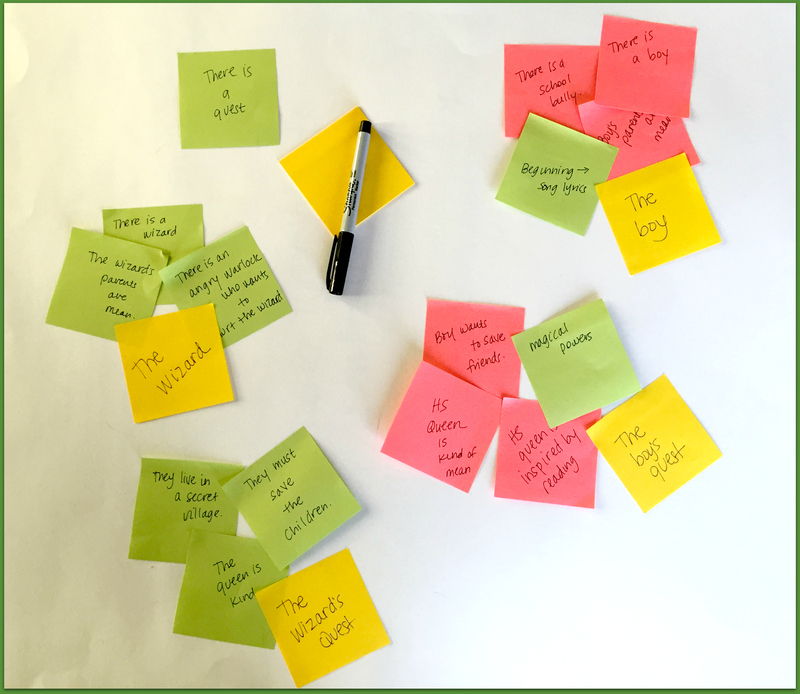 What if you started clustering those ideas and learning more about the shape of your story from the content of each cluster? 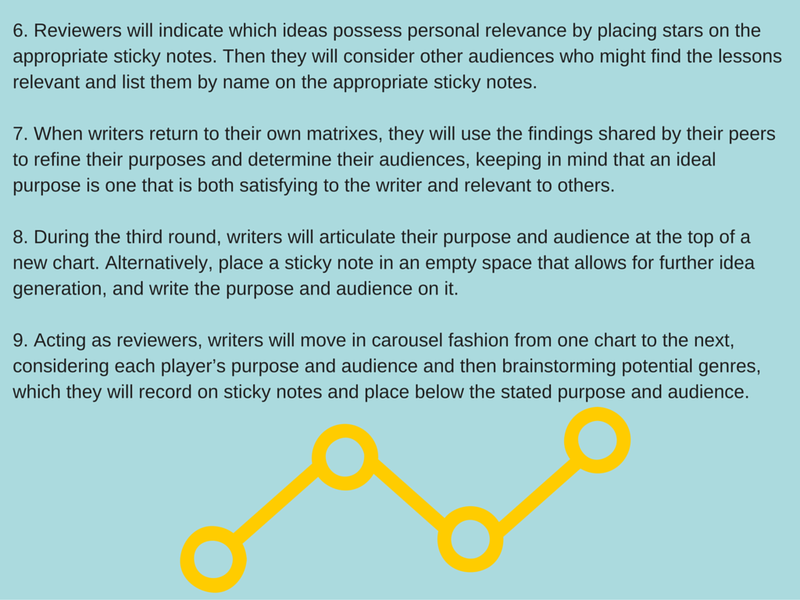 How would this effect the number and quality of the ideas that you generate? What would this process look like? Something else: See all of that white space in the photos above? It invites experimentation. 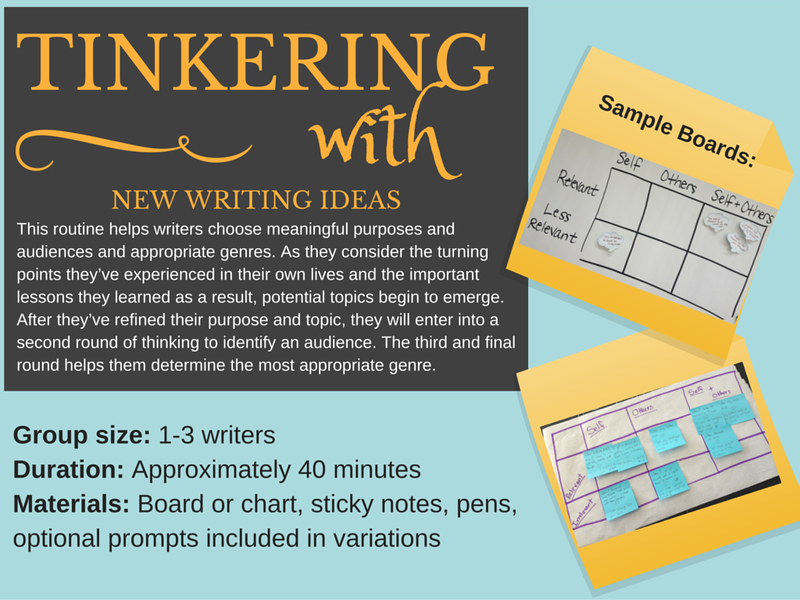 Writers can mix and remix those sticky notes, and when they do, new ideas emerge. There is plenty of room for new ideas, too. 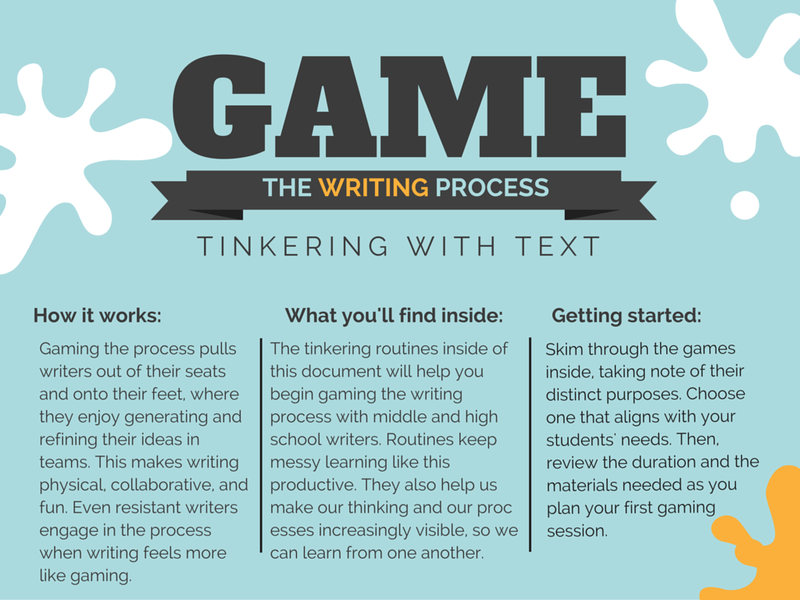 Here are a few other ways to game the writing process. And this is one of our favorite games. You can grab the original from Canva. If you’d like to read a chapter from the bestselling Hack Learning Series book, Make Writing, by Angela Stockman, download Hack Learning Anthology free at HackLearningFree.com. 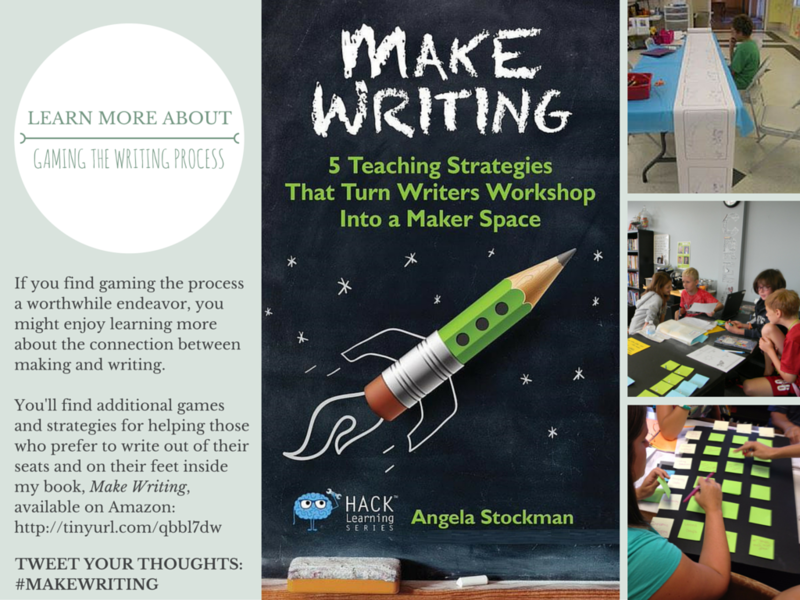 Angela Stockman is a longtime educator and the bestselling author of Make Writing: 5 Strategies That Turn Writer’s Workshop Into a Maker Space.